Last Christmas I made a Snow Owl Ornament for my woodland themed Christmas tree. 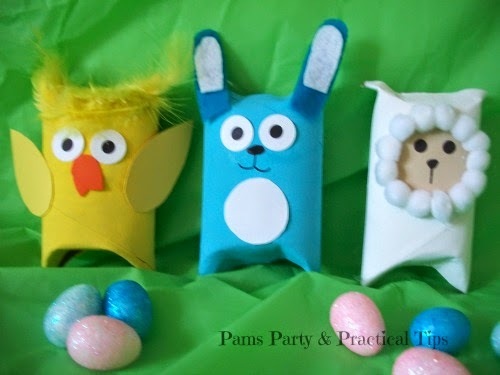 This spring I thought, why don't I try to make Easter/Spring animals in a similar fashion. I came up with a chick, bunny and lamb that can be used in a variety of ways. 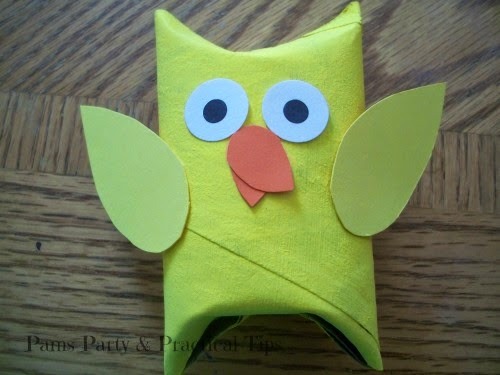 They are easy enough that kids can make them, and they are the perfect size to fill with candy or small gifts. The first step is to paint the cardboard tubes. I wasn't really sure what color I wanted to use for the bunny, but then decided on a bright color because the lamb was white. 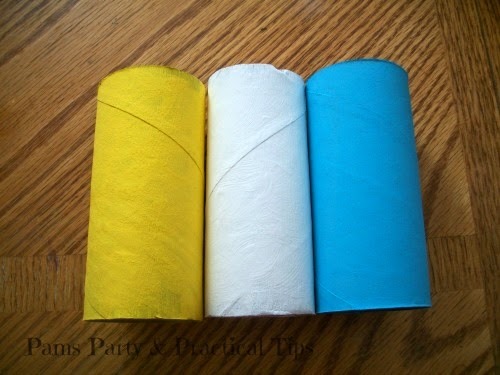 I then folded the ends of the tubes in one side at a time. If you are making this, you will end up with a shape that looks like this. The first box I made was the chick. 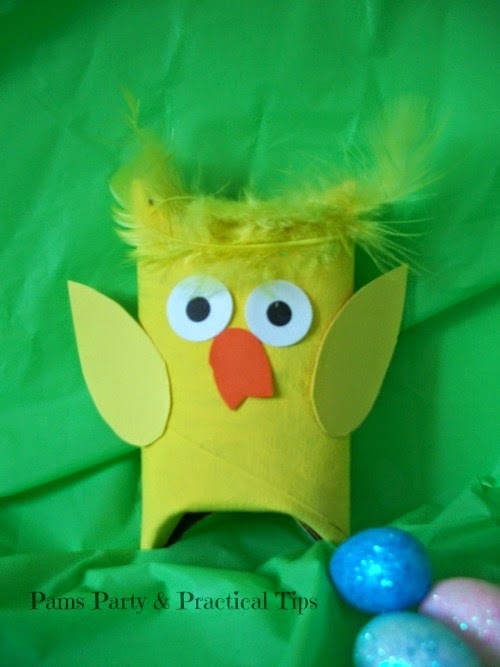 I used a small circle punch to make the eyes, and free handed the beak and wings. I thought it was cute, but it needed just a little bit more of something. Here is a small trick I use to make the black circles of the eye. I color the centers of paper enforcement stickers with a Sharpie. 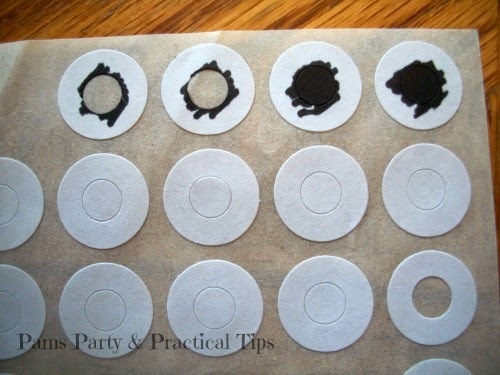 When the ink is dry, I then stick it onto my paper eye circle. I decided to add a few feathers on top to cover up the pointed ears. Feathers could also easily be used as the wings if you would like. Next up was the lamb. I cut a circle for the face out of a tan piece of paper. I used hot glue and started adding on small poms around the face. In this picture, I thought my little lamb looked a bit like George Washington. 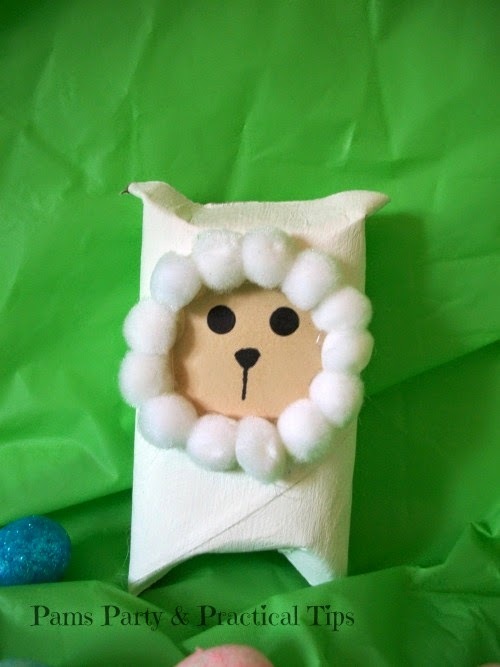 Here is the little lamb once all of the poms have been added. I folded the ears to the side to look more like lamb ears. You can't tell in the picture but when I was painting this tube, I added some texture by painting in a circular motion. 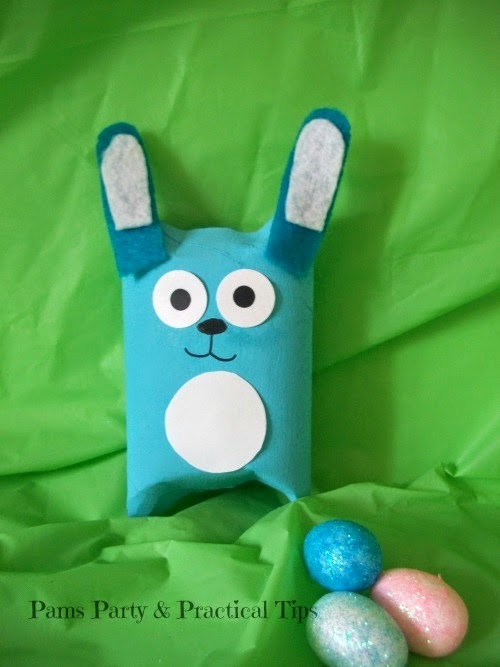 For the bunny, I cut a circle for his belly, and used hot glue to add felt ears. I tried adding a small piece of fake fur for the belly, but removed it because it did not look right to me. I might add some felt to the belly, and maybe add small bowtie. My little animals are now ready for Easter.! 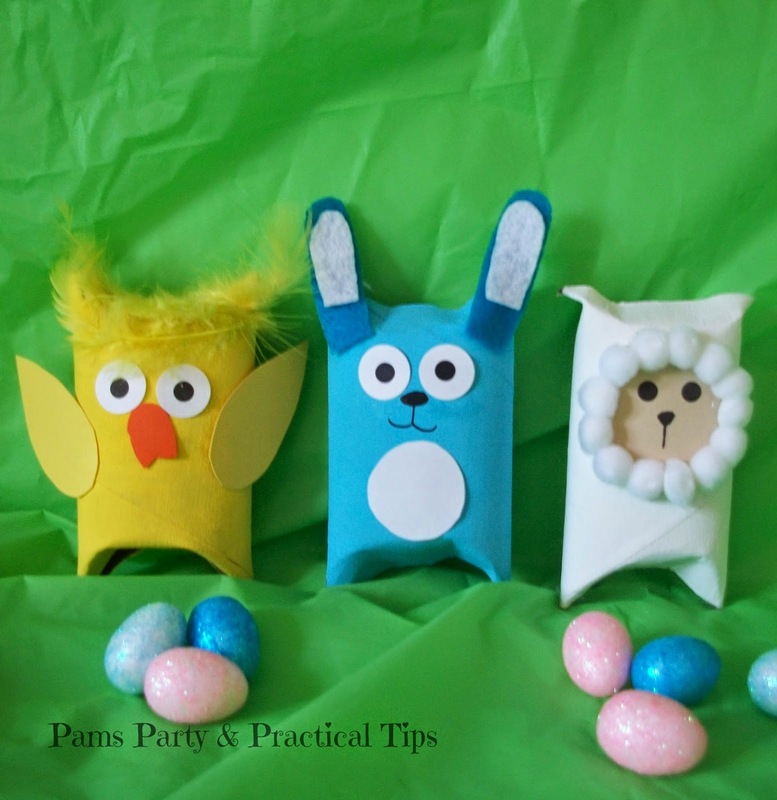 I will be linking up this post on the following linky parties here. 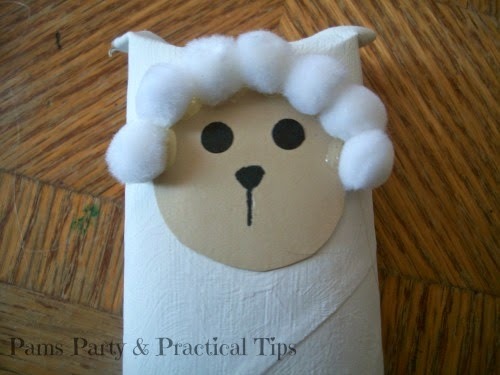 The little lamb is my favorite! Very cute idea! Thank you Heidi. I have always loved little lambs. those are super cute, I like the chick. Omgosh!! These are sooo cute!! Oh my gosh, so darling. So darling. I can't believe how simple, but how cute these are. These are absolutely adorable! and so creative!